Microdermabrasion is a wonderful treatment! Great for dry or dull looking skin, it can be used as a stand alone treatment or to enhance other treatments. During Microdermabrasion, crystals are pumped onto the skin having the effect of ‘chipping’ off the top layer of dead skin cells. Underneath is a layer of fresh younger cells giving your skin the appearance of a younger, brighter, smoother skin. And because the new cells naturally contain more moisture, you need fewer products on your skin. Now that you’ve removed the ‘armour plating’ of dead skin cells the products applied to your skin will absorb much easier. And for the same reason, other treatments can work quicker – such as skin rejuvenation, pigmentation or acne scarring. Not to be used in conjunction with any other offer. £50 non-refundable deposit on all appointments. It depends on your skin and what you want to achieve. After a full consultation you may need a course of treatments or just a maintenance treatment every 4 to 6 weeks. 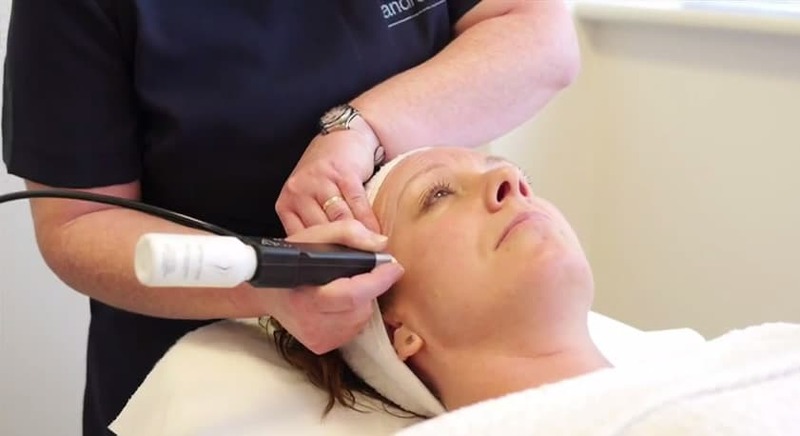 After treatment your skin may feel slightly warm or a little bit pink but there’s no ‘down time’ and because microdermabrasion takes only 30 minutes it’s a great lunchtime treatment!